For both of us, one of the biggest moments in our new relationships is introducing that person to Shopsin's. Brownie introduced it to me, and I have now introduced it to Kansas. He went with no advance look at the menu and knew what he wanted in less than 10 minutes. Bonus points were scored by getting something that involved mac 'n' cheese pancakes that I would never be able to finish: the Mo' Jemima. 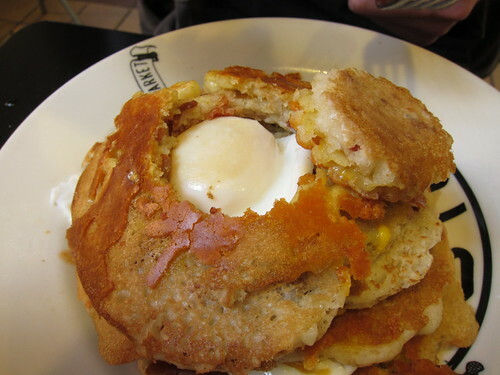 While I was happy eating another Mo'Betta, Kansas got a mac 'n' cheese pancake pyramid stuffed with bacon and Shopsin's perfectly poached eggs (they've got poaching down to a science!) He says it tasted awesome with hot sauce, awesome with maple syrup, awesome without either, and kept him full for a least five hours. It's $21, making it one of the most expensive things there, but damn it's worth it. Of course, he also got to see someone thrown out-always a plus. He now understands why Shopsin's is one of my few loves where I would cry tears of sadness should it be 1,000 miles away. Haha! I loved reading Kenny's book of recipes and the history of Shopsin's, I was dying laughing. 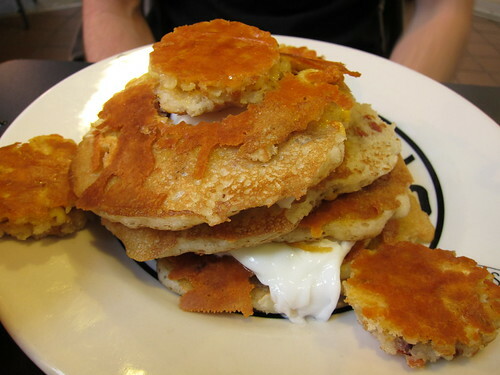 Those pancakes look amazing. Whereabouts do you guys live?! I feel like we must definitely JUST miss each other, visiting all the same places at different times. Out of control. OUT OF CONTROL. I ate this a couple of months ago and I still craving and salivating over it. It has everything that you want! I agree with Ultrateg. I'm afraid too but want that delicious food! Oh, yess! Excellent choice, Kansas! You know I love me the Mo' Betta, but I've been giving the Mo' Jemima the eye. A guilty pleasure of mine is burnt cheese. Those look like they would be chalk full of it!